The Freeman Cruiser fitted cover has been specially designed to help protect your Freeman Cruiser from the elements. 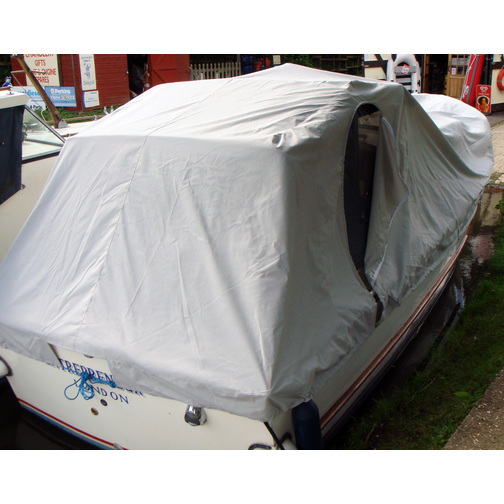 The Freeman Fitted Covers have been designed to help protect your Freeman from the elements, allowing you to easily cover your boat whether it's in or out of the water. 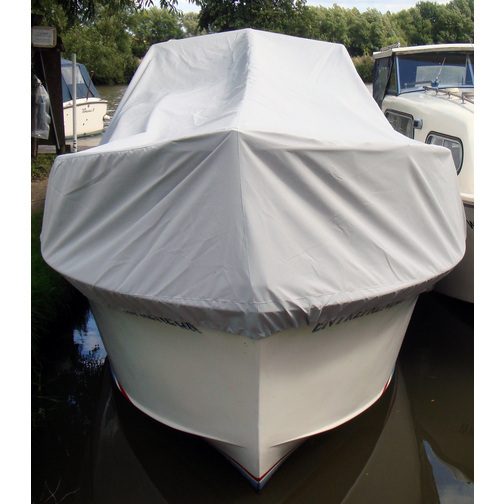 Use your fitted cover as a Freeman winter cover or use it all year round while your boat is on it's mooring. 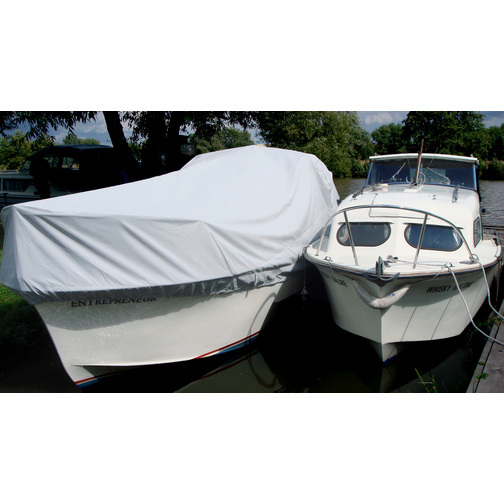 Don't spend all season cleaning your boat, clean it once and keep it protected with a fitted cover while you're not using it, keeping your boat sparkling clean ready for your next trip. Easy to fit ashore or afloat. Keeps your boat looking cleaner for longer. Prolong the life of your canopy by keeping it protected from the sun. 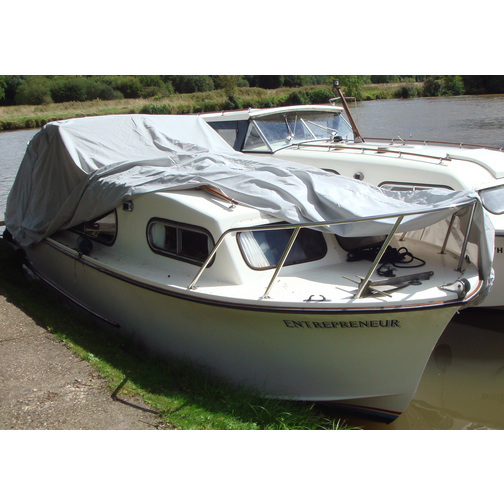 Allows access to your boat without removal. Specially designed for the Freeman Range. Each Freeman Fitted Cover features easy access zipped openings on either side, allowing easy access in to the boat without having to remove the cover. 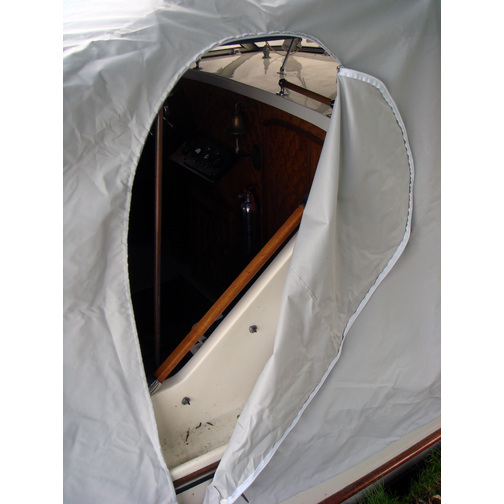 The covers can be fitted and used in or out of the water, they pull tight around the rubbing strake and feature additional tie down tags which allow you to run a rope under the boat when it is out of the water for extra fixing. 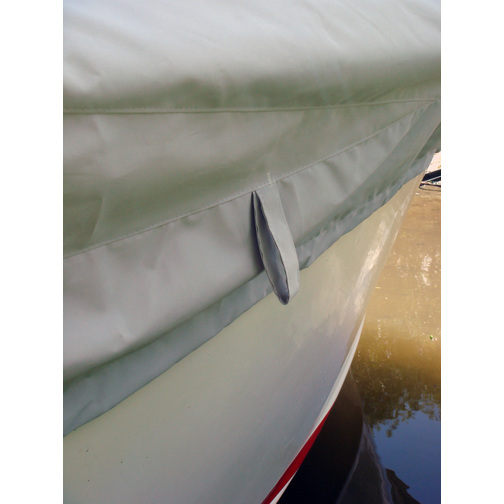 The fitted covers also feature Velcro flaps which allow your mooring ropes to pass through when your Freeman is on it's mooring in the water. The material features extra strengthening on the hard wearing areas, such as where the corners of the windscreen support the cover. Two zipped openings for access into the cockpit (one on each side). Draw string ties which pull the cover around the bottom of the rubbing strake. Tie down tags all around for additional fixing. Available in two different materials. Velcro flaps for mooring ropes to go through if covering while your boat is afloat. Extra durable padding at hard wearing areas. Silver Odyssey Material - Light weight and hard wearing (as shown). Lightweight, robust, repairable and hard wearing - notably the most popular choice as it can be easily used all year round and usually takes only one person to fit! Canvas Material - Heavy duty, hard wearing and available in a variety of colours. 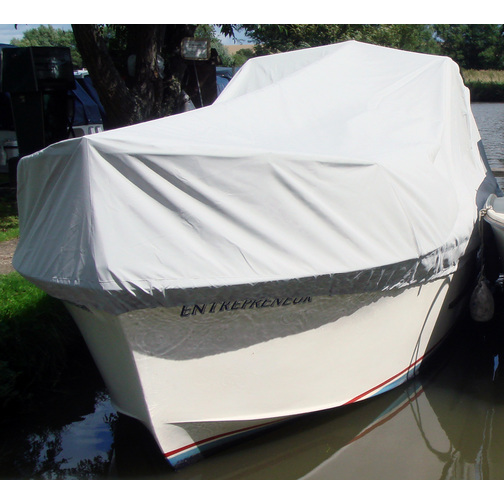 Hard wearing, robust and repairable, the heavyweight option - particularly useful for covering your boat during winter storage. All styles of the Freeman Fitted Covers are designed for particular Freeman models in order to achieve a better fit. For example there are different covers to suit the Freeman 22 Mk2, the Freeman 22 Mk2 with a hardtop, the Freeman 23 range, Freeman 24's and Freeman 27's etc. As the boat covers are made to order they can be adapted to suit your particular Freeman Boat, you can have your fitted cover made to accept Freeman Davits, extra features such as TV aerials, large spotlights or other items that cannot be removed from the cabin roof. If you want to keep your Freeman Cruiser protected and clean the Freeman Fitted Cover is for you. Freeman Fitted Covers are made to order so please telephone for more information and to order.